Volunteers plant the site in November 2003. Work on this triangular bushcare site, which measures about 70m by 40m, started in October 2003 when a GreenCorp team planted it with native species. 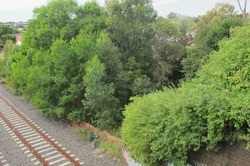 It is hemmed in by the Davis St road bridge that cross the railway line at Dulwich Hill near Hoskins Park, the little stormwater channel that eventually becomes the Hawthorne Canal, and the light rail line. Davis St in January 2008. 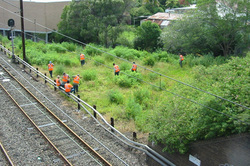 Like most of the sites, it was a jungle of weeds and railway rubble before work started. Many of the plants had matured by May 2012. Today it is a densely planted grove of natives species, with a canopy of Grey Ironbark (Eucalyptus paniculata), Red Ironbark (Eucalyptus fibrosa), Turpentine (Syncapria glomulifera) and White Stringybark (Eucalyptus globoidea). There is also a rich understorey of grasses, wattles, hakeas, hibbertias and grasses, among other things. 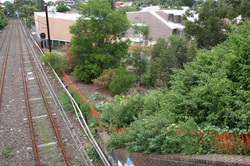 Native grasses and shrubs are now starting to self seed and has become a refuge for birds, small reptiles and insects. Lantana – definitely not a native and generally considered to be a serious weed – has been left on the site because it provides good habitat for small birds and possibly Long-nosed Bandicoots. The lantana will be replaced by native species, but this will be done gradually to ensure habitat is not lost. In the meantime, it also helps stop other weeds taking hold. Volunteers enter the site through a gate at the end of a cul de sac off Davis St. The site has no water supply so we hope we can get a water mains connection or have a tank installed that will collect water from any structures associated with the tram stop. Marrickville Council could plant natives in the rockery that flanks one side of the cul de sac off Davis St, creating even more habitat for native animals. We want eventually to remove the lantana and plant natives in a staged way that maintains good habitat. We may need professional help clearing the lantana and replanting because it is on very steep ground.